Seven Years' War Assn. Fun Weekend Imminent! The SYWA is honored to announce Colorado College History Professor Dennis Showalter as your guest speaker for the 27th annual convention. He has written extensively about the wars of Frederick the Great and 19th through 20th Century German military and political history. He is a former President of the Society of Military History and a visiting professor at the Air Force Academy and the United States Military Academy and he has taught at the Marine Corps University. On Saturday evening, he will speak about The Seven Years' War. Bring your copy of The Wars of Frederick the Great to be autographed. 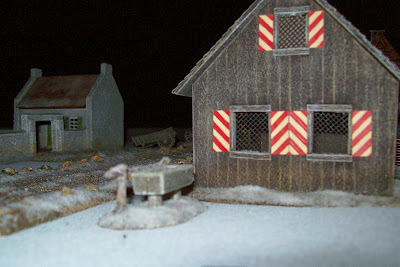 Situation: "Russians In The Snow Offensive"
Sleepy Winterfeldt the night before the battle. Russian Left flank. Peaceful winter wonderland. All images from here to the end of our photo story were kindly provided by Michael Mathews. Michael commanded the Russian left flank. Russian Right Flank: The bridge over the stream. Russian Left Flank. Prussians occupy Winterfeldt. Russian Left Flank. More Prussians. 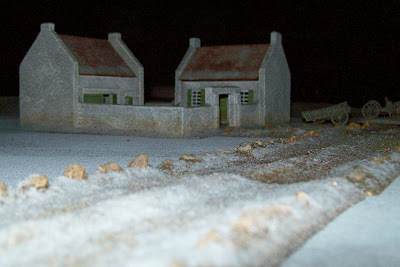 Note Prussian guns shielded and well-sited by a portion of the village. Russian Left Flank. Converged grenadiers assault Winterfeldt. Von Kleist's irregular infantry will yield their position after hand-to-hand combat. The Russians flow into the vacuum; "the high water mark," umm, snow line, of the Russians here. Russian Left Flank. Russian cavalry assembles to attack to the right of Winterfeldt. Russian Left Flank. Later the same cavalry has expectations of breaking through! However, they are diverted to their left because of trouble in the next two images. Russian Left Flank. A Russian howitzer started fires which eventually spread into more than half of Winterfeldt. Za counterattacking Prussians march through the smoke and flames. Russian Left Flank. Russian guns commence a withdrawal from bombardment positions. The left flank is no longer tenable. Russian Left Center. From the Russian perspective we are to the right of Winterfeldt. Note snowy redoubt held by the Prussians. See left center of image. Russian Left Center. Lots of guns Tovarich! The Russkis advance. The redoubt is in the upper right of the image. Winterfeldt is far to the left. Russian Left Center. It looked like the Russians would punch through. Russian Center: The redoubt is taken by the Russians in the upper left while the attack continues to the right of the fortification. Russian Right Center back Table. Russian cavalry assembles here prior to Turn 1. Russian Right Center. Prussians commence a massive attack against numerically weaker opposition. Russian Right Center. Uh oh! Russian Right Center. A huge cavalry melee erupted here. More Russians will add in from the right of the image to try to stem the Prussian tidal wave. They would not do so. It is only fate Vladimir. Do you want to live forever? Russian Right Flank. Prussians to the right of the idyllic bridge image seen near the top of our story. Russian Far Far Far Right Flank. Here too the Russians would be pushed back. More vodka, if you please. See Der Alte Fritz's blog for more images, considerable commentary and for the rest of the story. Every Russian unit shown was raised in the past two years, mostly in 2009.